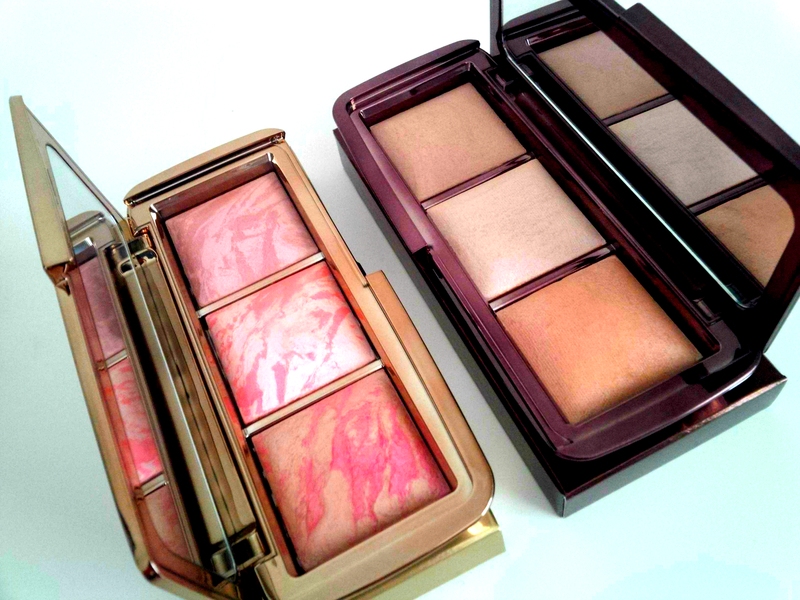 Hourglass has released two limited edition, beyond stunning, Ambient Lighting Palettes. The first highly successful product released was the highlight palette and after the high demand and success – the blush palette was then released. Both of these products are absolutely stunning. They are the only products that I own from the Hourglass range and specifically held out for these because I thought they were better value for money and I would use them more than just a regular product. I was right! The shades included in the highlight palette are; Dim Light, Incandescent Light (which is the shade that is exclusive to this palette) and Radiant Light. This is one of those products that I was definitely umm’ing and ahh’ing about for so long. After reading the amazing reviews, seeing the gorgeous swatches and make up looks created using this palette and hearing the good word of mouth – I finally caved! This product is stunning to use not just as a highlighter but also as an eyeshadow. I have been using this product constantly after purchasing and it shows no sign of wear whatsoever. A little really does go a long way with this product so you do not end up using much at all. When it comes to the shade colour, consistency, pigmentation and durability – you cannot go wrong. It is a bit of a hefty price tag but that really shows in the quality of this product – not just in the gorgeous packaging! One of the shades in this palette are actually exclusive to this product and is not something that you can buy on its own like the other highlight/blushes. The shades included in the blush palette are; Luminous Flush, Incandescent Electra and Mood Exposure. This product has been getting a whole lot of blog and instagram love lately! After purchasing the highlight palette I had absolutely no reservations about getting my hands on the blush palette and was constantly checking online and in store for the release of this product! I was fortunate enough to receive this as a gift (thank-you boo!! <3) but even after being able to actually use this product – if I had to buy it using my own money I definitely would. Just like the Highlight Palette, the colours, pigmentation, lasting power and overall effect leave nothing to be desired. The shades swatch beautifully and the hype is most definitely for a reason. The shades are perfect for all occasions and I feel that they are great for all skin types. The blushes have enough shimmer that you do not necessarily need to complete your look with a highlight unless you really want to brightly glow! In Australia, both of these palettes retail for AUS $76.00 each (at Mecca) even though the individual Ambient Highlight Powders are more expensive than the Blushes. The price tag is quite a big one – each individual blush/highlight in the palette are coming in at about AUD $25.33. However, that being said, you are paying for the quality of these products AND the limited edition label. Are these products something that you absolutely need? Honestly, I think that these palettes are more of a luxury item and something to purchase if you would like to treat yourself or if you are looking for a good quality high end product to invest in. You do not NEED them but both palettes are very nice products to own if you have the chance. I absolutely love both of mine and am very glad I made the purchase on the highlight palette and very fortunate and grateful to receive the second! But like I said it really does come down to personal choice. Overall, these products are both absolutely stunning and I have zero regrets when it comes to having spent money on Hourglass. I must admit, I am keeping one eye open for the release of the eyeshadow palette to hit Australian retailers! Omg! I need those in my life as soon as I can spend some money again! Btw. I am giving away an Urban Decay Naked On The Run palette, so if you’re interested, go ahead and check out my giveaway post! Hope you have a good day! Great makeup review! I have the ambient blush palette and I love using Mood Exposure when I want to do a red lip. Thank-you so much!! Ooh I have not yet tried that combination but definitely will 🙂 thank-you for reading and for taking the time to comment!! These are so pretty!!!! what a brill review…I may need to see if I can get my paws on these!